This page will introduce you to Indiana Raptor Center’s education ambassadors; you will learn how special they are, how they came to live here, and how they help us teach the public about their important role in the environment, and in our economic lives through rodent control. It’s truly rewarding to see the connections these avian souls make with the community. Please take a moment to learn their stories. We offer tours of our facilities as well; please see our current tour information. Elmo arrived in 2009 at the age of about 2 weeks. Another baby arrived a week later and they were raised together as cohorts, meaning that they each had a constant conspecific (same species) companion to help them grow up knowing that they were owls and not people. Unfortunately Elmo had spent some considerable time with his finders, which we did not find out until his behavior became different than that of the other owl in his company. Elmo exhibited symptoms of mal-imprinting, that is to say, he had spent critical growth time being inappropriately handled and played with by humans, so to this day he is not entirely sure that he is an owl. His cage mate was successfully released later in 2009, but it is illegal to release mal-imprinted raptors into the wild due to their tendency to seek out human mates. Therefore Elmo resides with us and is trained as an education program bird. Elmo is very intelligent and we are able to play structured games with him – he is also broody and perhaps should have been named Hamlet, but he was named for his big eyes and furry feathers instead. Moonshine was confiscated in 2010 from a possible meth lab location. 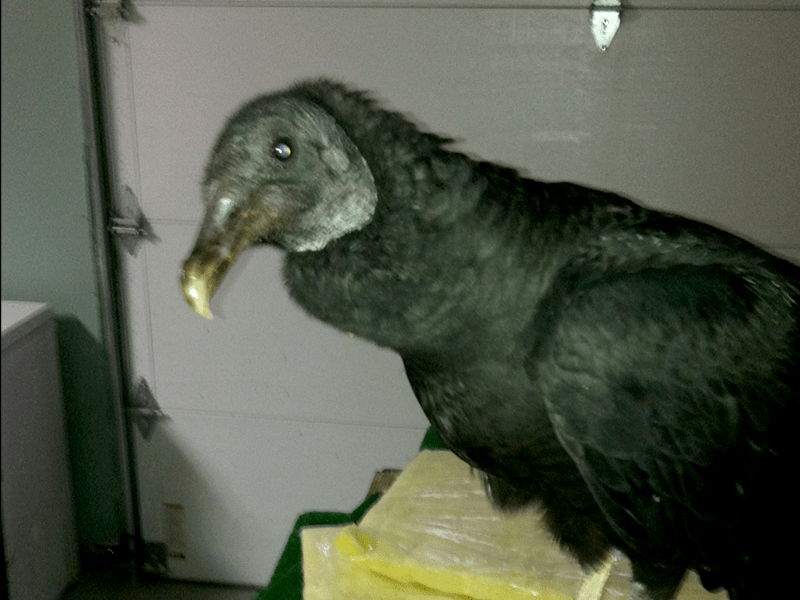 She had been handled and treated like a pet parrot, and was possibly damaged from chemical fumes. It took us a while to convince her that she was really an owl, and she, like Elmo, is non-releasable because of her situation. However she is a wonderful education ambassador. Her compromise situation is a housing cage up over the back yard of the center, where she can both look down on the activities of local birds, deer, and other critters without feeling threatened, and can still see in some windows to be sure we are still around. She does duet with local wild barreds, so we know that she has reached some sort of balance in her life and can continue to help us educate people on the wonders of raptors along with the illegality and consequences of trying to tame wild birds as pets. Simon is a wonderful little American Kestrel who also was confiscated from people who kept him as a pet. He was caged for 18 months from a nestling, and came to us with serious metabolic bone disease from an improper diet low in calcium, phosphorus and vitamin D. We received Simon in 2013; it was not until the summer of 2014 that we were able to handle him for education because he finally had enough bone density to prevent breakage. Simon is now greeting guests at the InRC. He is named for the British arborist who comes twice a year to trim trees that might endanger our cages and flight pens. Simon the kestrel will be going on road trips soon with the other education ambassadors! 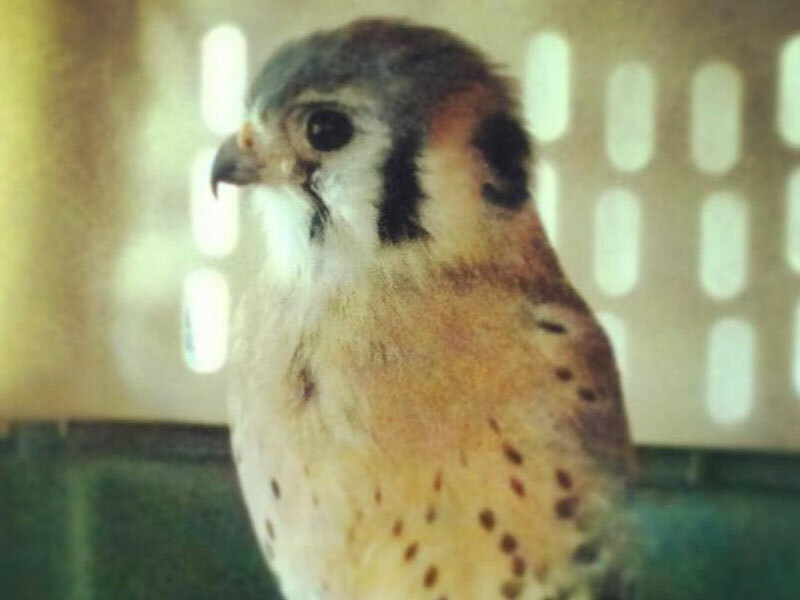 Digby is a beautiful little American Kestrel female who is quite the warrior. She came to the InRC in 2008 as a chick, and is blind in one eye from birth or an early accident. She is non-releasable due to her partial blindness, but holds court in a large enclosure where she is comfortable in free flight and fosters baby kestrels for us during the summer months. She teaches them to fly and hunt, and she misses them for a while when they are released. She helps educate the public over the winter because the American Kestrel is the only North American raptor with sexual dimorphism being present from the first coat of feathers (male and female have different feather patterns) but is ready for a new brood each spring, and lays (infertile) eggs to let us know that baby intake season is just around the corner! 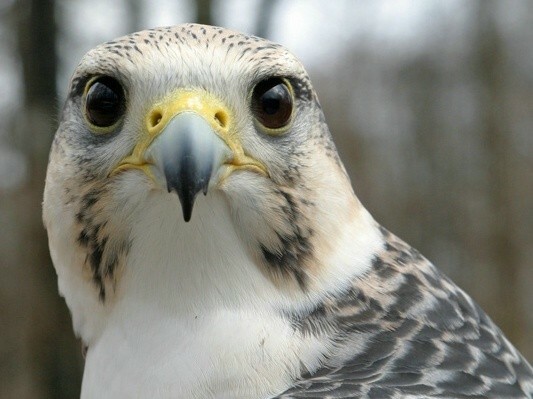 Mordecai, named for the falcon in the movie The Royal Tenenbaums, is a retired falconry bird, a white Gyrfalcon/Peregrine Falcon hybrid that was bred in captivity to be hunted on ducks. He hunted with a falconer for 9 years and took hundreds of ducks during that time. He was retired at age 9 because he had a perfect, no-accident record and the falconer did not want him to encounter injuries as he aged. So he came to live with us and is a magnificent, now 17 year old master ambassador. He is very vocal and work crews here on the property are used to hearing encouragement and instructions being called out from his mew as he oversees their activities. Mowgli is a female Great Horned Owl that was accidentally mal-imprinted on humans by another rehabber. She was transferred to us to be an education ambassador. Because she is such a hard mal-imprint, she has attached herself to one of our volunteers, Domonic Potorti (see his profile under “staff”). She believes him to be her mate and is jealous of his attention to other people or birds. This is a good example of the danger that can ensue from the release of a bird having this condition, however, while it is a shame that she cannot pursue her normal, wild life, she is relatively easy for him to handle and makes a wonderful education ambassador. Mowgli was named for the little boy in The Jungle Book, as she was raised and greatly influenced by a species other than her own. Born in 2008, she is a very healthy and large owl, having been fed quality food and vitamins ever since she was a hatchling. 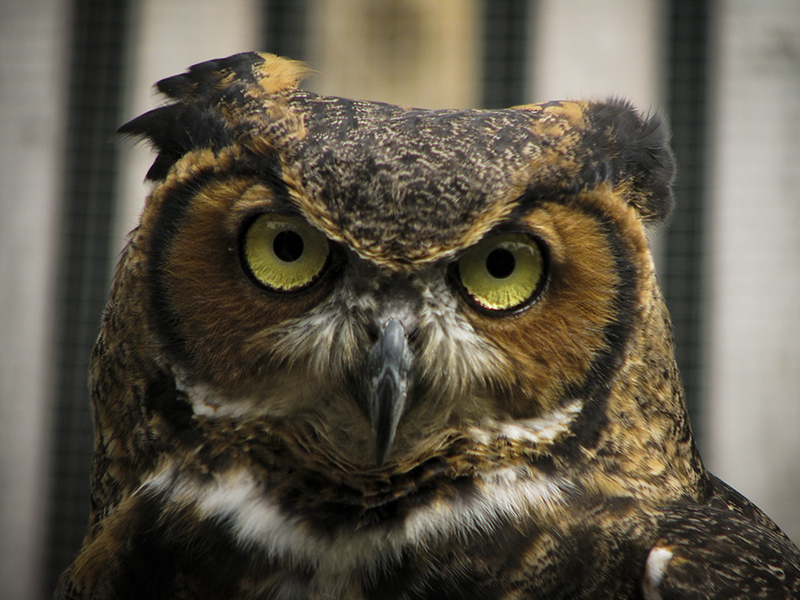 Great Horned Owls are called the “Tigers of the Sky” – they are strong warriors that are the only natural enemy of skunks. 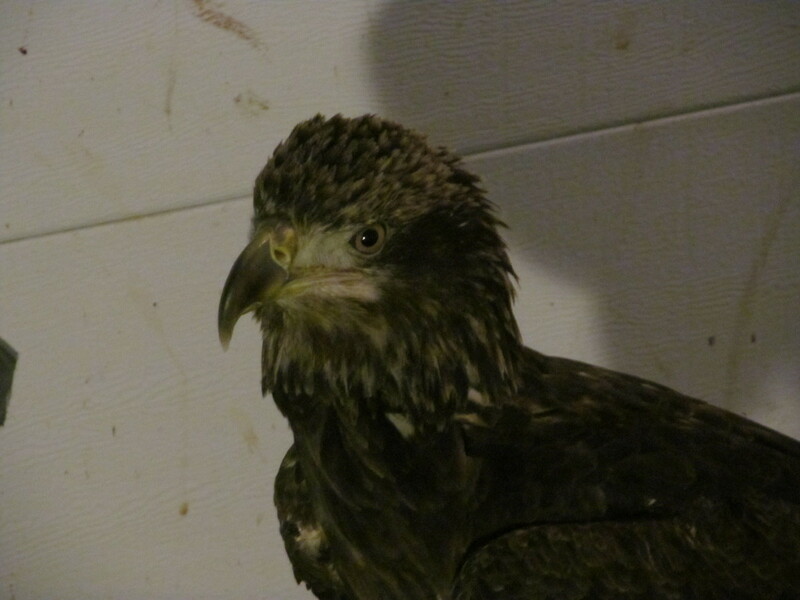 Ben is a Bald Eagle that came to us from World Bird Sanctuary in 2002. She was shot in Kansas in 1996 and sustained a non-reparable wing injury. She already had her white head and was not banded, so we are not sure how old she is. Estimates are around 24-28 years old. She weighs 9 lbs, so is smaller than Bald Eagles living in Alaska, which can reach up to 20 lbs. She can eat about a ½ lb of food a day, her favorites being Canadian Walleye or Rainbow Trout. Her cage-mate Piper is the same size and has the same tastes in food. Piper was hit by an 18-wheeler in Michigan; she, like Ben, sustained wing injuries that make her non-releasable. Piper is a younger female, banded in 2001. Piper still lays non-fertile eggs, and Ben helps her build the nest and set and guard the eggs. 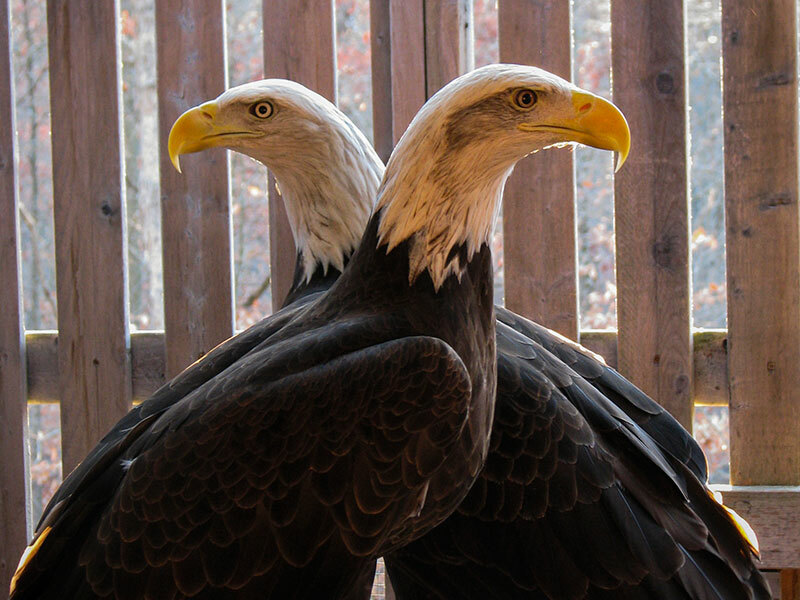 We are not allowed to breed eagles in captivity, but since both eagles are female, they are not in danger of producing young, and so are allowed to set the eggs until they complete their hormonal cycles. In addition to her wing injury, Piper sustained an injury to her chest which keeps her from making the complete eagle call that Ben uses to greet visitors. Instead, Piper has a gentle, pan-flute call, hence her name. The feathers that these birds shed are sent annually to the National Eagle Repository in Boulder, CO for distribution to Native Americans for use in sacred rituals. Fallon is a new addition to our center. A 7lb Bald Eagle born in 2012, he dislocated his right wing at an early age. Such soft tissue injuries are not reparable. The initial damage plus scar tissue do not allow complete rotation, hence such birds do not have complete freedom of movement and are non-releasable. The center that took him in as a patient told us that he is mischievous and likes to play tricks and with toys; couple that with our desire to name him something familiar to people, and you get the name! He will not have his white head and tail for a few more years, but by then will already be a pro at ambassadorship. He is progressing quickly in training, vocalizes with people, and responds to his name. In addition to education, we hope to train him to appear at funerals for fallen law enforcement officers and firemen, and to perhaps help send off and return troops at Camp Atterbury in southern Indiana. 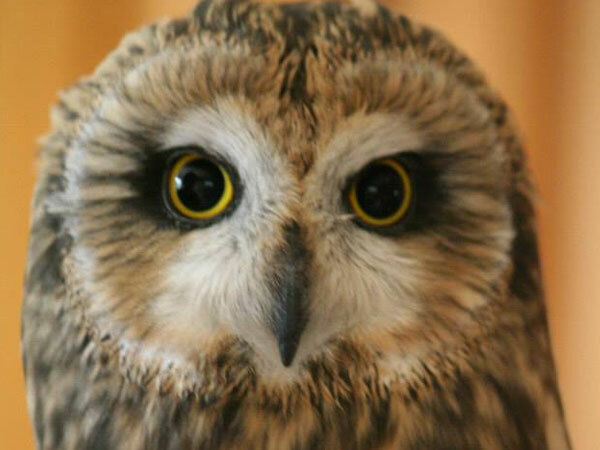 Sweetgrass is a male Short-Eared Owl of indeterminate age who also came to us from World Bird Sanctuary. He was hit by a car somewhere in Missouri and as a result lost the tip of his left wing. His housing is adapted to allow for balance issues (lots of flat, soft surfaces), and he has never had the foot problems usually associated with minor imbalances. He is excellent on the fist, and, like Moonshine, has bonded with our President. These birds are sub-Arctic and western prairie dwellers in the summer and migrate as far south as Indiana, Missouri and Illinois in the winter. They are shy and retiring, and hunt by coursing fields in search of small rodents. In the wild they are often found in the company of Marsh Hawks/Northern Harriers, who hunt the same fields in daylight that the owls hunt starting at dusk. He is named for the prairie grass sacred to Native Americans. 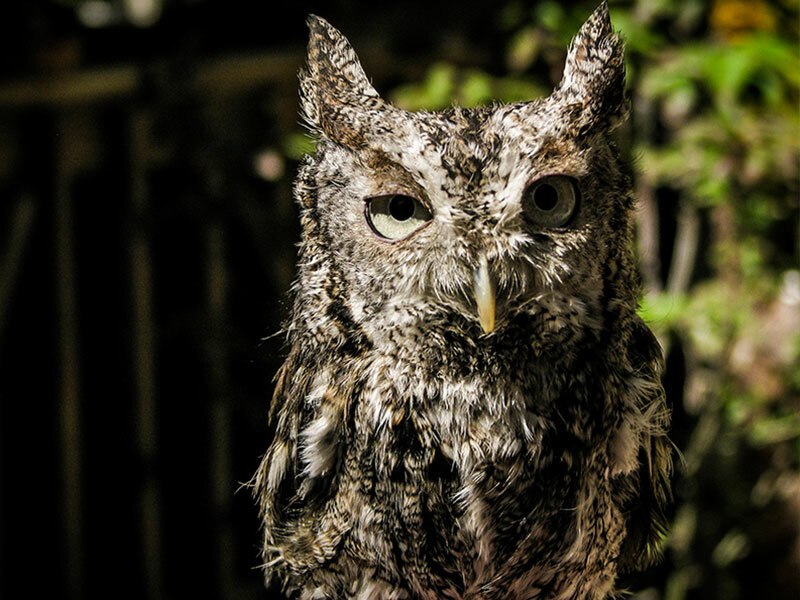 Bougie (short for Boudreau) is our very special, Cajun-named grey-phase Eastern Screech Owl. 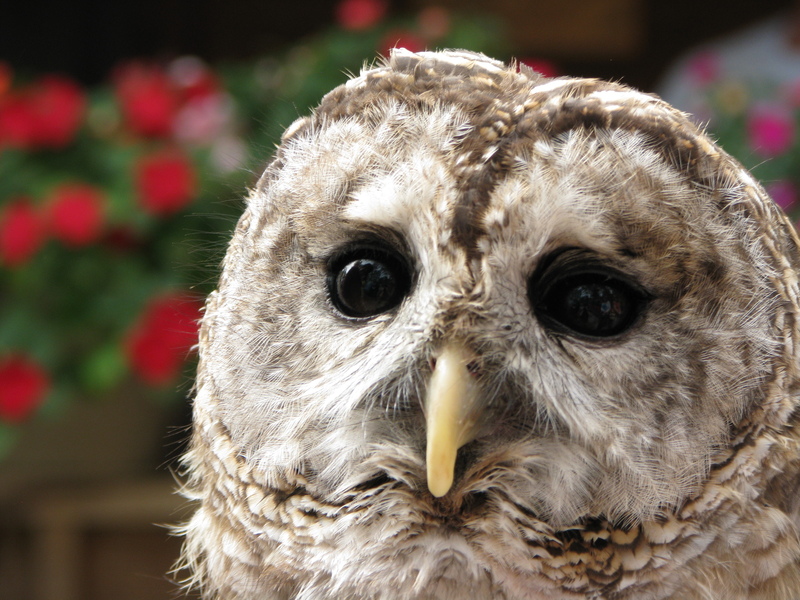 Born in 2009, he is a neotinized owl, that is, one that retains physical baby characteristics into adulthood. This usually results in malfunctions and inabilities, rendering him challenged. In Bougie’s case, he cannot fly due to his head being a little too big for the rest of his stunted body, and his wings being a little too short. His uropygial gland (the one at the base of a bird’s tail from whence it gets the oil to treat its feathers and manufacture vitamin D) does not work well, meaning that his feathers remain fragile and not waterproof. His housing is therefore indoors, as getting wet in the weather can cause him to die of hypothermia. Original attempts to house him outdoors left him frightened and huddling on the ground in corners, because he could not take care of himself. Used to being handled by rehabbers due to his situation, he is charmingly habituated, but not mal-imprinted as he was raised with conspecific cohorts. He makes both adult owl calls, and young nest noises when dealing with his handlers due to familiarity. He is a big favorite on the education circuit. 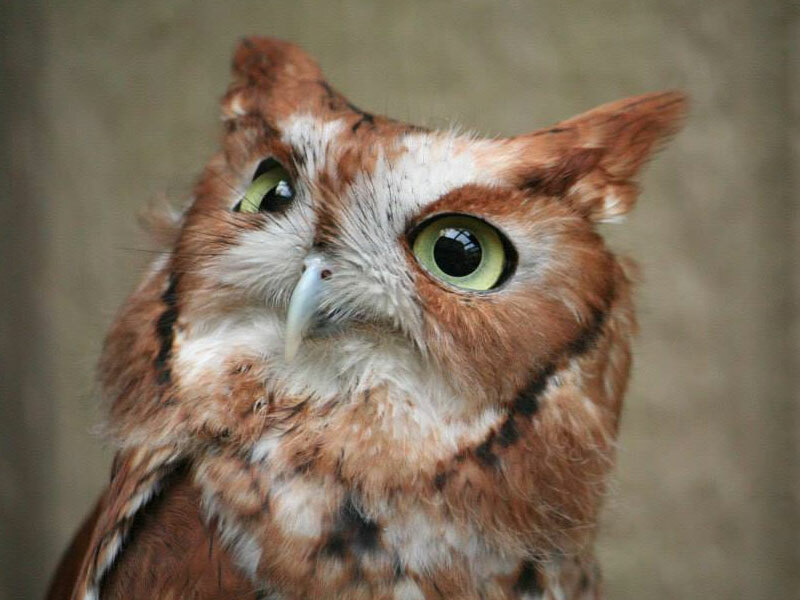 Grendel is a female red-phased Eastern Screech Owl who was born in 2011. She is non-releasable due to a car-strike-caused wing break that could not be correctly repaired due to the nature of the break. Breaks that shatter or splinter bone, or that occur close to a joint, are usually impossible to pin because of the need for a reasonable amount of intact bone to use in pinning. Wings can sometimes be saved by using wrap bandages and allowing the bone to callus on its own, but this seldom guarantees flight; more often it renders the bird able to move around in captivity, but not to be released. Such birds, if of appropriate temperament, can have a life in captivity as education ambassadors; and Grendel is a beautiful, gentle one. Her name calls to mind the fairytale monster of Beowulf, because she originally was defensive of her space; however now she is happy to sit with a trainer or hit the road to greet those eager to see her in person. Zulu, received from World Bird Sanctuary by Laura Edmunds in 1997, is also an exotic, non-native bird. She is an African Augur Buzzard, otherwise casually known as the “Red-tailed Hawk of Africa.” Because these birds are mountain dwellers (flying as high as 17,000 ft), her wings are much longer and deeper than those of a Red-tailed Hawk, and cross over her tail, which is a maroon red. 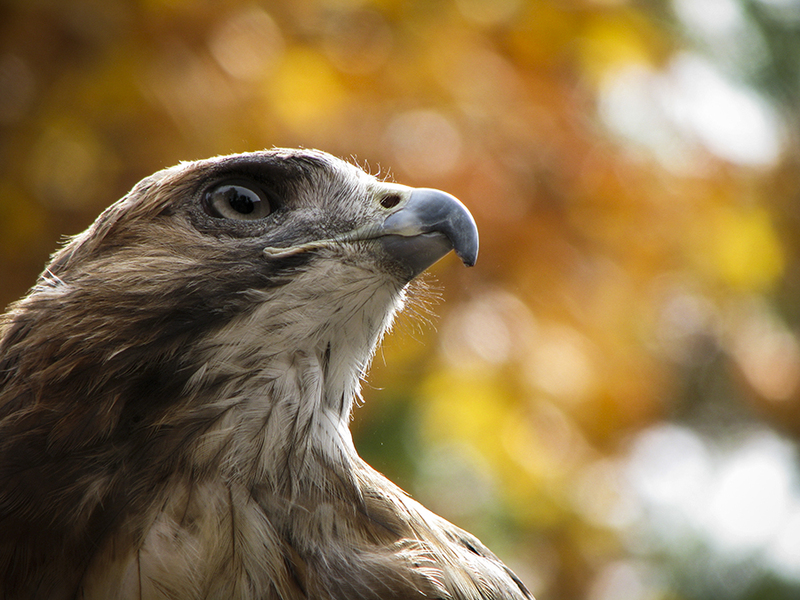 Augur buzzards are often used to portray Red-tailed Hawks in movies and commercials, since native species cannot be legally used in the US to promote for-profit business. Zulu was hatched from the first brood of this species in the US. Her parents were confiscated from bird smugglers in South America. She is not used for breeding because she is double jointed and would not be good for the gene pool. However she is a magnificent ambassador. Her preferred human – or more accurately her only preferred human – is our education director, Laura Edmunds. Zulu disdains all other people and especially anyone wearing brown shoes, though no one knows why. Igor came to InRC in 2013 from Raptor Rehabilitation of Kentucky in Louisville for a second opinion due to his behavioral issues. We believe that Igor may have been raised by people, or had an early head injury, or both. He flies fairly well, but is not afraid of people and loves to play with toys, learn tricks, or stand around and listen to conversation. Obviously it would be dangerous for him to be released, so he lives here now as an exhibit bird. We have not tried him in programs because vultures that are unhappy with being handled tend to vomit in defense! He sees lots of people on tour here at InRC, who find him interesting because we don’t have many Black Vultures in Indiana – they normally live farther south. They are smaller than Turkey Vultures and have black heads instead of red. Because he is a southern species, Igor has two houses, a well-equipped pen for summer where he can observe goings-on in the local woods, and a minibarn for winter, where he can hole up out of the wind and arrange his furniture. Which he does. Bailey is a female Red-tailed Hawk who came to InRC with Laura Edmunds when she moved here from Fort Wayne, IN and the Soarin’ Hawk raptor organization. Bailey was found starving under a nest tree with an incorrectly healed broken wing when she was a fledgling. The wing had broken and healed in the nest without the benefit of veterinary care to ensure correct bone positioning. Bailey has therefore never flown, and has lived most of her life in captivity. She is close to 15 years old now, and we are watching for arthritis in that wing – but medication can keep her comfortable into Red-Tailed Hawk old age, which is usually early to mid-20s. She is a powerhouse warrior program bird, steady as a rock, and a big part of our education efforts. Oberon is approximately 5 years old. He was born in captivity and trained from the get-go for education. He came here from a center in Michigan. Oberon was named for the king of the fairies in Midsummer’s Night Dream by William Shakespeare. We call him Obi for short, recalling another delightful epic. 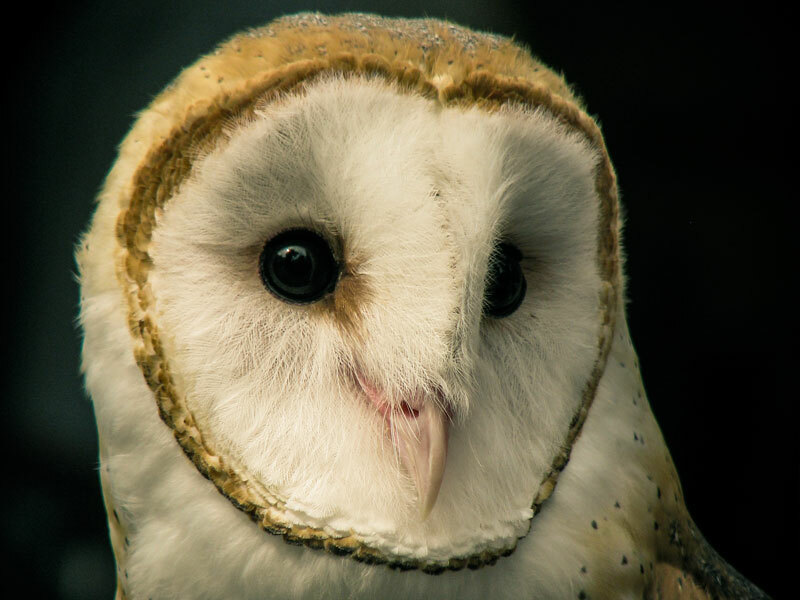 Barn owls are endangered in Indiana; they were once more abundant when the area offered more accessible wooden barns. The barns were perfect nesting sites, since livestock helped them stay warm in winter and they boasted hay for nesting and mice for catching. The feather cover on these owls is not as heavy as that of a Great Horned or Barred, so they are usually found south of the Ohio River, though with winters in general being warmer, they are once again moving into some southern Indiana counties. Pale white with large wings, dark front-facing eyes, and a horrible shriek, they may have been the inspiration for ghost stories that pepper the history of the pioneer move west. Beau and Phoenix are our resident falconry birds, both Harris Hawks from the Coulson lineage developed in south Louisiana. 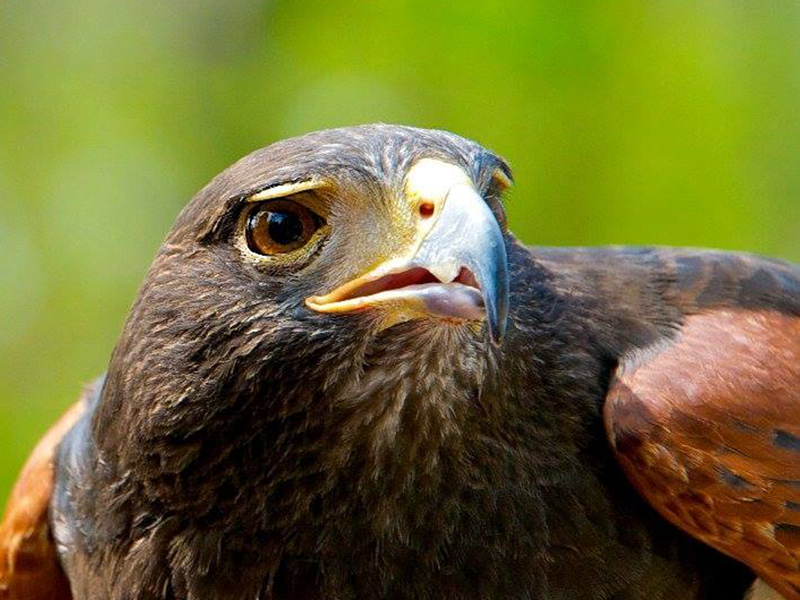 Harris Hawks are noted for their intelligence and athletics. They are built like small golden eagles, and are considered perhaps the most intelligent American raptor because in the wild they hunt cooperatively in packs like wolves; they plan hunting strategies; they care for each other’s nests in case of death; and their offspring stay a second year to help raise the next brood. All of these behaviors provide life lessons that can be taught to humans during our programs. The hunting behaviors make these birds very desirable for the sport of falconry, where a bird and a person hunt prey cooperatively – in this case, rabbits. Both birds have been extensively and successfully hunted by multiple skilled falconers. The birds are now both in their late teens, but know when the air changes in the fall that bunnies cannot be too far behind. 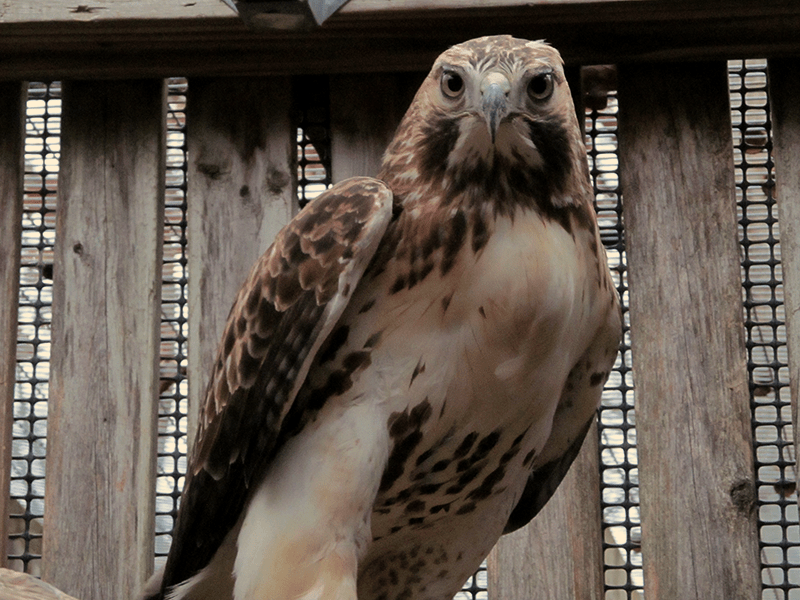 Toby Martin is a 1.5 year old male Red-tailed Hawk that also came to us as a rehabilitation patient. He presented here with his right humerus (the bone between his shoulder and elbow) shattered in three pieces, with the bone end at the elbow joint displaced at a 90 degree angle! Our wonderful veterinary surgeon, Jennifer Clarke DVM, was able to piece the bone back together, but fragmentation at the time of the break resulted in the bone being shorter than necessary for equal use of both wings. Also the patagium (skin that stretches between the shoulder and wrist on a bird’s wing) was tightened, despite physical therapy, due to the amount of time the wing was bandaged for bone healing. This was a tricky case from the start, due to the number of bone fragments; physical therapy to stretch the wing threatened to twist the fragments while they healed around the pins, so could not be as rigorous as we wanted. Twisting while the bone heals results in calluses that can put strenuous torque on the bone when the bird tries to fly after healing, re-breaking the bone in other places. So, despite the successful surgery, Toby Martin lives with us now. And he will be making a fine ambassador in 2015! 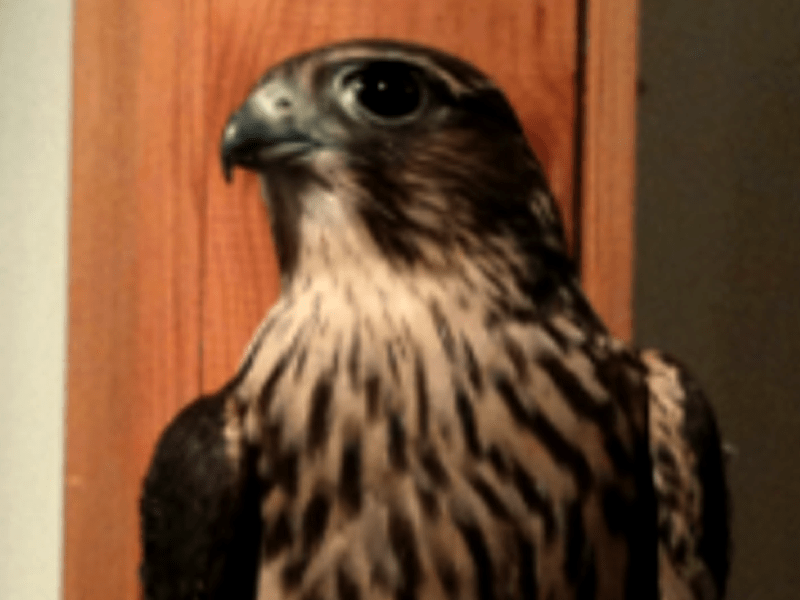 Our first Merlin, Brandeau arrived at Indiana Raptor Center in December 2014. He is a handsome, snappy little falcon, smaller than a peregrine, but larger than an American kestrel, and is still wearing juvenile plumage (see his photo, and check out the swept back stripes on his head). He came here from Washington State University in Pullman, WA and is non-releasable due to a dislocation of the right elbow. 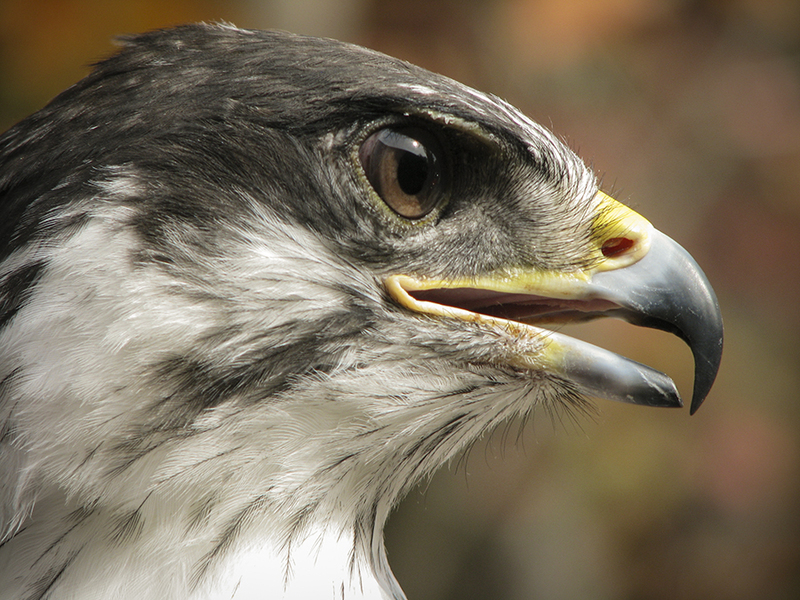 Soft tissue injuries like this are non-reparable and tend to develop non-removable scar tissue in the joints, so he is left with incomplete extension of his right wing, making it impossible to fly like a healthy falcon should in order to hunt. He had some training while in his former home, so has settled right in and made himself at home with us. He loves an audience, is curious about people, and so will start to appear at programs in spring 2015. 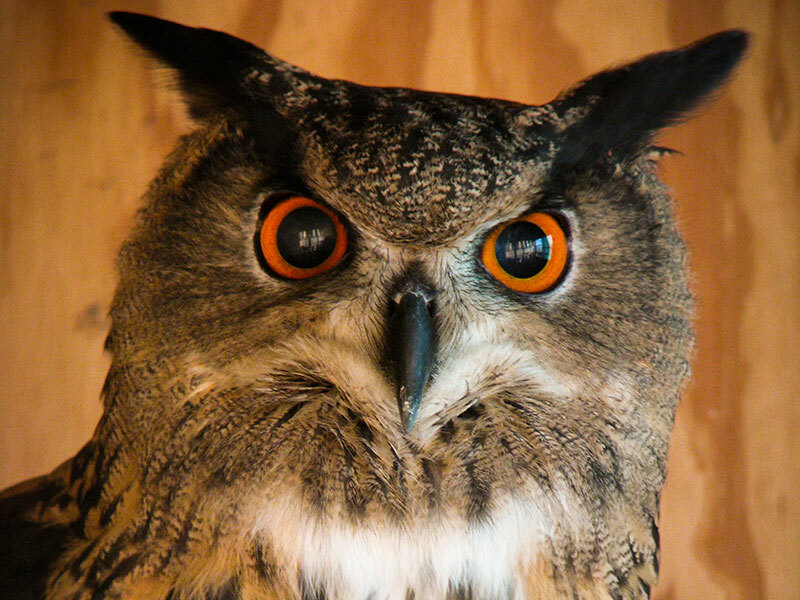 Tickle is a Great Horned Owl that was originally a patient here at Indiana Raptor Center. He presented with an injured left shoulder, and neurological symptoms resulting from a head strike. Our theory is that he was hit by a vehicle on his upper back, damaging both the wing joint, and nerves in the head and shoulders. These injuries being soft tissue and nerve related are the slowest to heal, and as in this bird’s case, usually result in permanent damage. He would not survive in the wild, so lives here. His name is derived from two sources – first, our foster Great Horned Owl is named Snuggles; second, his personality and presence is very much like that of Tickle, a star of the Moonshiners TV series – very laid back for a Great Horned Owl.